The Open Source Initiative explains it well. When people can read, redistribute, and modify the source code, software evolves. People improve it, people adapt it, people fix bugs. The results of open-source development have been remarkable. Community-based efforts to develop software under open-source licenses have produced high-quality, high-performance code on which much of the Internet is run. Without open source implementations of existing algorithms, testing new ideas built on existing ones typically requires the time-consuming and error-prone process of re-implementing (and re-debugging and re-testing) the original algorithm. If the original algorithm were publicly available in a community repository, imagine the productivity gains from software reuse! Science evolves when previous results can be easily replicated. 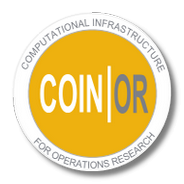 The COIN-OR project is managed by the COIN-OR Foundation, Inc., a non-profit educational foundation. We are building an open-source community for operations research software in order to speed development and deployment of models, algorithms, and cutting-edge computational research, as well as provide a forum for peer review of software similar to that provided by archival journals for theoretical research. Enter your name and email address in the space below and click Subscribe; A confirmation email will be sent to you, asking you to click on a link to complete the process. Our download page describes how to download COIN-OR components. After downloading, read the INSTALL files for instructions on installing. Check out the documentation available on COIN-OR software. If you have any trouble, send us feedback! Whether you’re having a little trouble getting a component to work, you’ve found a bug, you have a suggestion, or you just want to let us know about your experience using COIN-OR software, we’d like to hear about it. Send an email to the appropriate mailing list. We’ll try to answer any questions promptly, and all kinds of input will help us improve COIN-OR. If you’d like to keep up with COIN-OR developments or take part in discussions about COIN-OR, consider subscribing to one or more of the lists. Running the COIN-OR Foundation is a lot of work and we need your help! If you would like to donate your time, we need help with many different tasks, including Web development, coding, and general administration. Please check the Help Wanted wiki page or e-mail us. If you would like to contribute to COIN-OR, we’d love to have your help. For bug reports, just send an email with your contribution to the appropriate mailing list. Minor changes are generally made fairly quickly. For contributions to existing projects or submission of new projects, see our code contribution page, which has details about the procedures we use. If you’d like to help but don’t have a particular task in mind, we can probably help you find one. First, however, you should get familiar with COIN-OR. Download and try out any of the projects you’re interested in and subscribe to the coin-discuss mailing list to get a sense of what’s going on. When you know what basic area(s) you’d like to help with, send an email to coin-discuss indicating what parts of COIN-OR you’re most interested in. We should be able to suggest something at that point.